We Sell flour to home bakers in 1.5- & 3-pound bags, and wheat berries in 1- & 2-pound bags. FOR WHOLESALE ORDERS: IN THE CHICAGO AREA, PLEASE CONTACT CENTRAL BAKING SUPPLIES. IN THE ST. LOUIS AREA, PLEASE CONTACT EAT HERE ST. LOUIS. 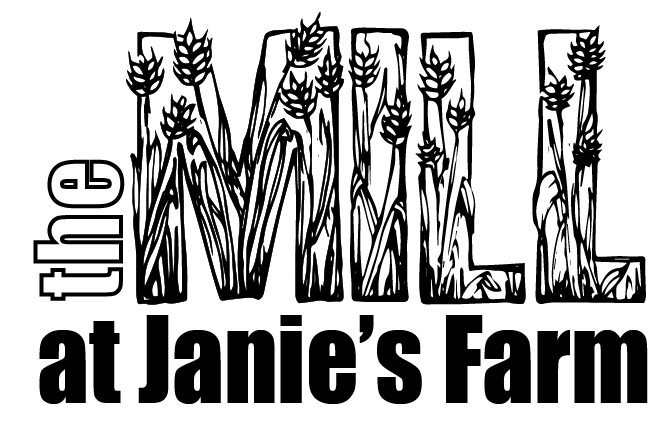 THE MILL AT JANIE’S FARM IS A NATURAL EXTENSION OF JANIE’S FARM ORGANICS. WE HAVE BEEN GROWING CERTIFIED ORGANIC GRAINS FOR OVER 15 YEARS, AND ARE NOW MILLING THE GRAINS WE GROW, AS WELL AS THOSE GROWN BY OUR ORGANIC FARMER NEIGHBORS. Our mill was custom-made especially for us by Engsko, a Danish company that has been in the milling business for over a century. Although it's brand new, this is the most ancient type of mill, feeding whole grain kernels between stationary and rotating mill stones. We carefully monitor the temperature of the stones to ensure that they stay cool and preserve all the nutrition of the whole kernel--including the bran and germ, with all of their essential proteins, oils, vitamins, and minerals. Even our sifted flours contain 70-90% of the whole kernel, so you get more flavor, and more nutrition. Not only are our stone-ground, organic, whole-kernel flours nutritionally superior, they taste better! The different wheat varieties we grow produce unique flavor profiles (described under "Our Flours" below) that range from deep and earthy to light and creamy. We work with both heritage and hybrid varieties of wheat, rye, oats, and corn. The grains and flours we offer vary seasonally, so please contact us if you are looking for something in particular. Close collaboration from field to oven: Mill manager Jill Brockman-Cummings, mill owner and farmer Harold Wilken, and Ellen King, co-owner and head baker at Hewn Bakery, discuss the taste and performance of different flours. Wheat is "the staff of life" for Western civilization, and The Mill at Janie's Farm delivers the full nutritional profile contained in every kernel. This is why we call our flours "whole kernel" instead of whole wheat, since many whole wheat flours have had the life, taste, and nutrition processed out of them by high-speed roller mills. Mill Manager Jill Brockman-Cummings keeps close watch over every step of the milling process to ensure you get whole kernel flour with maximum taste and nutrition. Outstanding in their fields! Everything starts with our fertile organic soils. Then our knowledgeable farmers work with professional bakers to develop a range of flours for all your baking needs. We provide whole kernel flours ranging from specialty heirloom flours like Turkey Red, to Artisan Bread flours, to All-Purpose and Pastry flours--in bags from 1.5 to 50 pounds. We also have whole wheat berries available. Let us know what you need, and we'll work with you to provide it! We are committed to supplying you with the most delicious, nourishing, and best-performing flours you have ever used. Scroll down for all the details. Thank you! RIVERS OF GOODNESS! We named our flours after the rivers gently flowing through Illinois. Just as rivers are the life-blood of the Midwest, carrying water and nutrients to plants and animals, so THE MILL AT JANIE’S FARM pours out rivers of delicious, nutritious, certified organic, whole-kernel flours and grains for you. PLEASE NOTE: Our flours are sold in 1.5- and 3-pound bags, and wheat/rye berries and wheat bran in 1- and 2-pound bags. (Please contact us if you'd like larger amounts.) These small bags make it easy for you to have one bag open for use, while un-opened bags stay fresh in a cool, dry place. You may freeze the flour for up to 6 months, but the flavor and nutrition will be best if you use the flour as soon after milling as possible. TO ORDER: Simply click on the items you'd like, and then click "add to cart." Turkey Red Wheat came to Kansas with Russian Mennonite immigrants in 1873. It originated in Turkey, and was grown in the breadbaskets of Europe for centuries, prized for its hardiness, rich flavors, and excellent baking qualities. Professional and home bakers alike are raving about this special blend of hard red spring, and hard red winter wheat. The sifting produces a smoother flour perfect for the crackling crust and airy crumb of baguettes and boules. Although the resulting loaves are light in texture, they are robustly flavored. This is a more finely sifted version of our “Wabash” Artisan Bread Flour, a special blend of hard red spring and hard red winter wheat. The fine sifting produces a soft, pillowy flour perfect for the crackling crust and airy crumb of baguettes, boules, and other traditional artisan breads. This sifted bread flour produces a velvety texture and bright, clean flavor in sourdough and yeast breads, rolls, and enriched breads. Bakers report good extensibility, and holds up well to long fermentation. We finely sift our organic all-purpose (AP) flour, resulting in a smooth, pillowy, creamy texture, and delectable baked goods that retain nearly all of the taste, nutrients, and live enzymes of the whole kernel. Most grocery store all-purpose flours are processed by roller mills, then bleached and bromated, so most of the goodness is lost. In addition to being great in breads, cookies, muffins, etc.,many bakers say that our finely sifted AP flour makes an excellent pizza dough! The term “white ﬂour” is often used to mean “reﬁned ﬂour,” so “white whole wheat ﬂour” sounds like a contradiction in terms . . . but it’s not! We stone-mill this flour from the WHOLE wheat berry of the WHITE wheat we grow, a variety called Frederick, and then we finely sift it so that it’s perfect for all cakes, muffins, even pizza! This light-colored yet full-flavored flour has a lower gluten level than red wheats, and a milder flavor. White wheat does not contain the strong-ﬂavored phenolic compounds that give red wheat its color, so baked goods made with white wheat require less sugar or other sweeteners. Our white wheat flour is very versatile —good for yeast breads, quick breads, cookies, cakes, pastries, pie crusts, biscuits, and crackers. Our pastry flour produces yeasted baked goods with nice volume and a delicate, rich, silky crumb. It is also excellent for cakes, pie crusts, cookies, muffins, and brownies. Spelt is an ancient grain, an 8,000-year-old relative of durum wheat that originated in present-day Iran. From the near-East, it spread rapidly throughout Europe, becoming especially popular in Germany. Spelt has never been hybridized, so has retained its wholesome nutrient profile. Our spelt flour is milled on our cool millstones to retain its full nutrition and flavor. This wheat gets its name from Frederick Gfeller (1904-1970), who worked on making the initial crosses and subsequent selections for what would become known as Frederick white winter wheat. He worked at the Ottawa Research Station Central Experimental Farm in Canada, and his Frederick white wheat was grown widely in Canada and the upper U.S. from the late 1950s until around 1980. It was valued for its disease resistance and the soft, light, fluffy flour milled from it, and we are happy to be growing and milling this white wheat. This beautiful Bloody Butcher corn is grown by our Certified Organic neighbors at Cow Creek Farm. Rita and Jeff Glazik and their children have run a diverse, certified organic crop and livestock farm for over 20 years, and you can taste their deep rich soil in the deep, rich flavors of this corn. Bloody Butcher is an heirloom variety of corn with a fresh, sweet, nutty, buttery, "corn-y" aroma when we mill it. And that translates into all those delightful flavors when you eat it! This beautiful ivory cornmeal flecked with burgundy makes a fabulous cornbread, but you can use it in corn muffins, cookies, cakes, crackers too. This Bloody Butcher corn is grown by our Certified Organic neighbors at Cow Creek Farm. Rita and Jeff Glazik and their children have run a diverse, certified organic crop and livestock farm for over 20 years. You can taste their deep rich soil in the deep, rich flavors of this cornmeal. Our “polenta” or “grits” cornmeal is ground from the same certified organic yellow dent corn as our cornmeal. We just set the grindstones a little farther apart to get a more granular product. In addition to making polenta or grits, you can use this product to make spoonbread or tamales. It’s also great to use on your pizza stone before putting the dough on it. No matter how you use it, you’ll get great whole-kernel taste and nutrition. To preserve all of that goodness, keep your cornmeal in the freezer until you’re ready to use it. We stone-grind our certified organic white dent corn into a medium-fine cornmeal that’s perfect for cornbread, corn muffins, corn cakes, corn cookies, hush-puppies, and even as an addition to your favorite yeast or sourdough breads. As with all of our products, you get the nutrition of the whole kernel. To preserve all of that goodness, especially the essential oils in the germ, it’s best to keep this cornmeal in the freezer until you’re ready to use it. This medium/coarse grind of our certified organic white dent corn makes a creamy, flavorful polenta or grits. You can also use it for spoon bread or tamales or even cornbread, although you may want to let it soak in water or milk overnight before making your cornbread (or use our more finely ground Organic White Cornmeal). However you use it, you’ll enjoy it’s fresh, clean taste and aroma, and you’ll enjoy knowing you are getting 100% of the whole-kernel nutrition. To preserve all of that goodness, keep this product in your freezer until you’re ready to use it. We mill the entire buckwheat groat, including the hull, so our buckwheat flour is darker than that from de-hulled buckwheat. It’s also more nutritious and contains more fiber, thanks to the hull. In the U.S., buckwheat is most often used for pancakes, but it can also be added to many yeasted and quick breads, muffins, and cookies. In Asia, the most common use for buckwheat flour is to make noodles, including the famous Japanese soba. Buckwheat flour is high in protein but very low in gluten, and so is usually mixed with wheat flour—many bakers suggest using 20-30% buckwheat flour. Try it in combination with our wheat flours in your favorite baked goods or noodles. Choose 1.5 or 3 pound bag. Rye has been used by artisan and home bakers for centuries, and is now experiencing a renaissance, thanks to the excellent flavors of heirloom and hybrid varieties, such as the Brasetto pictured here in our fields in early June. Brasetto is a hybrid developed by the German breeder KWS to have excellent nutty flavors and a high yield. Rye is a much softer grain than wheat and we mill it into a beautiful grayish-blue flour that’s fluffy and velvety smooth (1.5 pound retail pkg). European bakers like to make a 100% rye loaf that is dense and delicious and keeps well. Our bakers love to add rye to a wheat loaf to boost its flavor and moisture. You can experiment with the percentage of rye flour until you get a loaf that matches your desired density and taste. We also use this whole-kernel rye flour in brownies! Here’s the recipe for the Violet Bakery’s famous Rye Brownies. Our whole-kernel rye flour delivers not only a rich, hearty taste, but enormous health benefits. Just 1/2 cup of rye flour provides 1/3 of your recommended daily fiber. Rye is also high in the important B vitamins, as well as crucial minerals such as potassium, magnesium, calcium, manganese, iron, cobalt, copper, zinc, chrome, phosphorus, iodine, and boron. We coarsely mill our whole organic rye berries to make cracked rye. This is a very popular addition to traditional breads of northern Europe. You may also substitute cracked rye for cracked wheat in taboulleh and many other grain salads and middle-eastern dishes. Or add it to your favorite bread or cracker recipe for added texture and flavor. It’s also great sprinkled on top of any bread dough just before baking to give your loaves a distinct look and a delicious nutty flavor. You may also use it as you would steel-cut oats, in a hearty, wholesome breakfast cereal. Rye isn’t just for baking! Our whole rye berries can be cooked as you would pasta (but a bit longer! ), and then used in a breakfast bowl, dinner grain bowl, or salad. Try this rye berry salad, and feel free to substitute whatever herbs, nuts, or fruits you have on hand. To prepare, simply measure out the desired amount of rye berries into a saucepan and add three to four times as much water and salt to taste. Bring to a boil, reduce heat, cover, and simmer for about an hour or until tender. Drain and set aside to cool, or serve immediately. With whole rye berries you get the maximum nutrition this grain has to offer! Our cracked wheat has all the flavor, fiber, and nutrition of our whole wheat berries, but provides greater versatility in your kitchen. Just soak the cracked wheat in water to soften, then add to yeast breads for a satisfying texture. Or boil cracked wheat with milk or water for a hot breakfast cereal (think oatmeal, only different). Or use it as your would rice in a main or side dish by cooking it in a broth with some vegetables and herbs. And of course there is the classic Middle-Eastern tabbouleh salad with cracked wheat. Try this tabbouleh recipe, but note that our cracked wheat is raw, while bulgur is partially-cooked cracked wheat. So you should soak or cook cracked wheat for a longer time than does a recipe calling for bulgar. Wheat bran is the fiber-rich and nutrient-dense outer shell of the wheat berry. In the sifting process for some of our flours, the unprocessed bran is gently removed. Wheat Bran can be used in most baked goods (not just bran muffins, although here's a good recipe for those! ), added to smoothies, salads, and more. Bran is chock-full of B-vitamins, protein, and important minerals, including Iron, zinc, and selenium. We offer 1 and 2 pound retail bags of bran. Please contact us if you would like to purchase larger amounts. Wheat berries are the whole, complete grain, so they provide you with the maximum fiber, protein, essential oils, B vitamins, and other nutrients. Flavor profile: Sweet, nutty, and earthy, our wheat berries works well in savory meat and vegetable dishes, as well as in desserts and breakfast dishes. Great to use instead of rice or barley in soups, salads, pilafs, or casseroles. Simply simmer in water until soft, and then use in your favorite recipes. Because wheat berries retain their shape and chewy texture even after long cooking, they are perfect for soups and stews. Wheat berries also make a delicious and nutritious breakfast bowl—just toss the cooked wheat berries with fruit, nuts, yogurt, honey, and cinnamon. Try Martha Rose Shulman's Breakfast Wheat Berries. Wheat berries are the whole, complete grain, so they provide you with the maximum fiber, protein, essential oils, B vitamins, and other nutrients. GLENN has the highest protein of all our wheat varieties. Great to use instead of rice or barley in soups, salads, pilafs, or casseroles. Simply simmer in water until soft, and then use in your favorite recipes. Because wheat berries retain their shape and chewy texture even after long cooking, they are perfect for soups and stews. Wheat berries also make a delicious and nutritious breakfast bowl. Kutya is a traditional Christmas wheat berry pudding in parts of Eastern Europe and Ukraine. Try this recipe made with milk, honey, dried apricots, raisins, almonds, and poppy seeds!